A swanky send-off for an extraordinary off-roader. It’s hard to believe that the Mercedes G-Class has been around for nearly 40 years riding on the same platform. That’s about to change, however, as Mercedes will soon be to mark the iconic off-roader’s 40th anniversary. In the run-up to its impending demise, we’ve seen a spate of special edition G-Classes, like the . Turns out Mercedes has been saving the best for last as it waves goodbye to the G65. The German manufacturer has just revealed the exclusive Mercedes-AMG G65 Final Edition which commemorates the legacy of the most powerful series production off-roader. Limited to only 55 units worldwide, the G65’s sporty exterior has been enhanced for the Final Edition with large 21-inch 5-twin-spoke alloys finished in bronze, complemented with silver brake calipers and AMG Sport trim strips on the side. Elsewhere, the underride guard, sections of the bumpers, wheels, and side mirrors are coated in matt bronze to make the SUV stand out. The spare wheel cover is also finished in obsidian black, while the radiator grille features a black mesh screen and surround painted in matt bronze. The interior is just as extravagant. The Mercedes-AMG G65 Final Edition is equipped with the Exclusive package featuring black nappa, brown topstitching and carbon fiber trim elements throughout. Floor mats have also been fitted with leather edging and milled 'Edition' lettering in the grab handle. At its heart is a 6.0-liter twin-turbo V12 producing 621 horsepower and 738 lb-ft of torque. Power is sent to all four wheels through a seven-speed dual-clutch automatic gearbox. 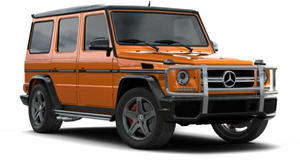 0-62 mph takes just 5.3 seconds before the G63 reaches an electronically limited top speed of 143 mph. Unsurprisingly, the Mercedes-AMG G65 Final Edition isn’t cheap. Prices for the G65 Exclusive Edition was already expensive with prices starting at 287,658 Euros ($340,663), but the Final Edition will set you back a hefty 310,233 Euros ($365,213).